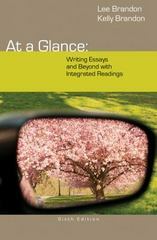 At a Glance 6 Edition Fresh, vibrant, concise, and affordable, the Sixth Edition of AT A GLANCE: WRITING ESSAYS AND BEYOND, WITH INTEGRATED READINGS, focuses on writing correct, effective essays in specific and combined rhetorical patterns. It also emphasizes revision as a critical part of the writing process. You'll find professional and student essays that will inspire your writing, a handbook chapter covering fundamentals, insights into career-related writing, a chapter that walks you through the ten steps of writing a research paper, and more.